Adapt your home to your idea of comfort with the right temperature in the right place at the right time. The all new AirTouch 4 is a smart air conditioning controller that is the fusion of comfort, energy efficiency, smart design and ease of use. AirTouch provides more than just cooling or heating but also becomes part of a lifestyle…an experience. The brand-new 8” HD touch screen console is bigger; and displays brighter, bolder colors and features a slider at the bottom of the screen to make it easier to adjust the setpoint temperature. It also makes it easy to adjust the conditioned air flow in 5% increments across 16 zones from 1, 2, 3, or 4 different ducted air conditioning units. Just say the word with smart integrations for voice control of the air conditioning: The new AirTouch 4 works with popular and open voice-activated smart assistants like Amazon Alexa and Google Assistant. So with whoever you choose to control your air conditioning, AirTouch will respond. 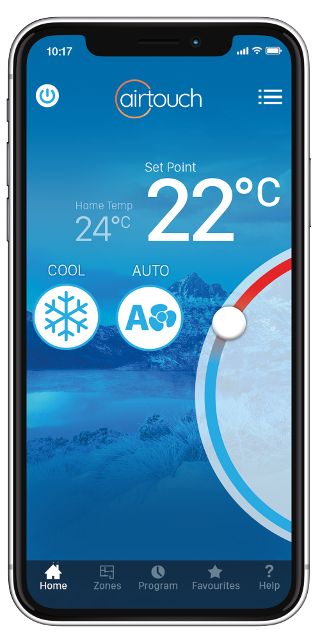 Enhance the capabilities of your AirTouch 4 with the free app for iOS or Android. 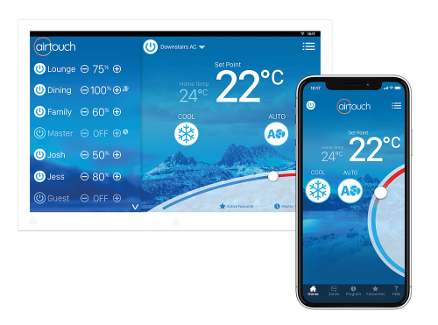 All the controls, including individual zones, timers, favourites, temperature slider, mode and fan speed are replicated on the new AirTouch 4 app. You can save energy by turning off the system remotely when you are away from home, but also make sure home is comfortable for you when you walk in the door by turning on the air conditioning before you leave work to head home. Another great feature of the app is automation home temperature alerts. If home is getting a bit warm or cold, you can choose to receive temperature alerts reminding you to turn on the climate control before you set off home. you can have a different set point temperature in each room. With ITC, AirTouch monitors temperatures and smartly adjusts airflow as needed around your home with the aid of wireless temperature sensors instead of a single sensor in 1 location. When some rooms get too hot or cold, AirTouch will adjust their airflow to maintain temperature, without wasting conditioned air on rooms already comfortable. You also get an additional wireless On/Off switch for each zone in your home which also doubles as the smart wireless temperature sensor. As AirTouch doubles as an Android powered tablet, you can use it to run your choice of smart lighting, security and entertainment apps, or even order a meal while keeping up with the latest on social media. Only run the AC where you need it with Smart Zoning. Plus, with runtime tracking, energy and airflow management technology, you can be sure of greater efficiency and energy savings from your family’s air conditioner.